Tina – The Tina Turner Musical and Ghostlight Records present the first single from the upcoming original cast album. 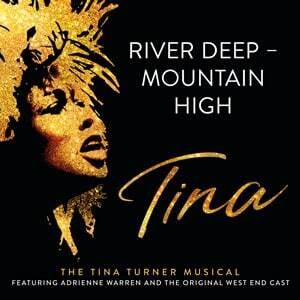 River Deep, Mountain High featuring Adrienne Warren is the first single released today from the forthcoming Tina – The Tina Turner Musical cast album. Tina Turner famously recorded River Deep – Mountain High in 1966, produced by Phil Spector as his ground-breaking masterpiece using his trademark Wall of Sound music technique. Turner would later recall, “I must have sung that 500,000 times. I was drenched with sweat. I had to take my shirt off and stand there in my bra to sing”. George Harrison, who worked with Spector when he later produced Let It Be for the Beatles, would later call it ‘a perfect record from start to finish’. River Deep – Mountain High was recorded in January 2019 at Angel Studios and produced by Tina- The Tina Turner Musical’s Musical Supervisor, Nicholas Skilbeck. Tina Turner said: “At that very difficult time in my life, recording this song opened my eyes to possibilities. I felt liberated, excited, ready to challenge myself vocally. River Deep – Mountain High introduced me to the way I wanted to sing. I am thrilled that Adrienne has picked up the mantle and not only risen to the challenge but made this moment one of my very favourites in the musical. It is so right that this is the first single to be released from our cast album. She makes me very proud”. It was also announced today that Adrienne Warren will open with the show when it transfers to Broadway this autumn. Warren will play her final performance at London’s Aldwych Theatre on 13 April 2019.